2001-Number two in a series of five little paintings. Acrylic on stretched canvas. 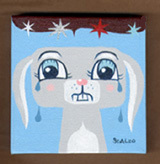 Art measures 4" x 4".